Let's talk garlic. It's one pungent food, so knowing how to work with and control it is vital to good tasting food. Let's start with the science behind how garlic works. Learning how garlic works, the science of garlic, will make you a better cook. 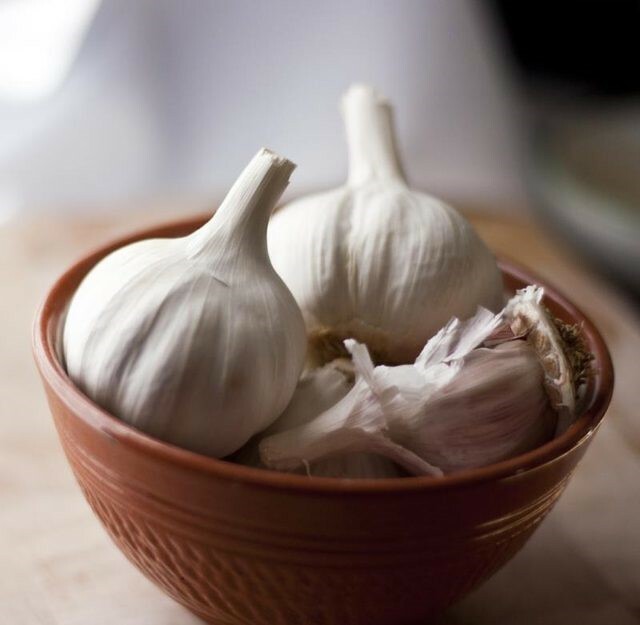 Have you ever wondered why garlic can sit on your counter for days and not smell? It is because an uncut head of garlic has almost no odor. It is not until you cut the garlic that you smell that pungent aroma. Why is that? It all comes down to compounds and enzymes. Raw garlic contains bothalliin (a sulphur compound) and alliinase (an enzyme). 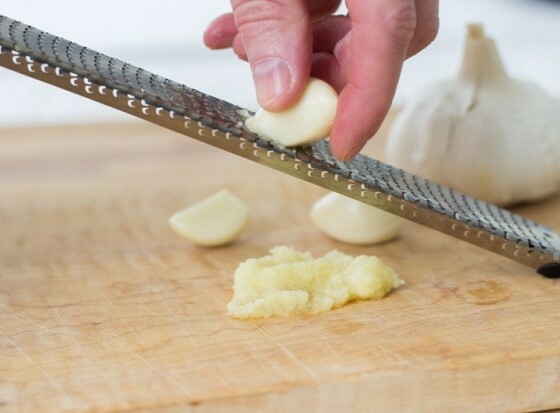 As soon as garlic is cut, minced, chopped, or pressed, bothalliin and alliinase mesh together and the alliin transforms into a new compound called allicin-that strong garlic flavor we love so much. The more you cut up garlic, the more allicin is produced, and the stronger the garlic flavor. Thus the strength of the garlic is very dependent on how you cut it. Slicing usually yields the weakest flavor due to very little allicin being produced. For the strongest garlic flavor you want as much allicin as possible, therefore the best thing to do is mince it into a smooth paste. We all know, though, that garlic's strength (STRONG aroma and flavor) is also its biggest weakness (STRONG aroma and flavor). Lots of research and money has been devoted to ways to eliminate garlic odor from hands after working with it. 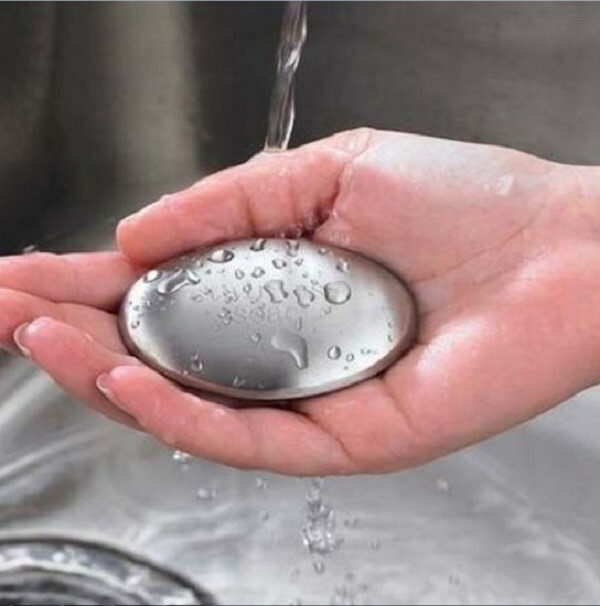 One of the surest techniques is to rub your fingers on stainless steel. The stainless steel Magic Oval sells for about $3 and prices go up from there. 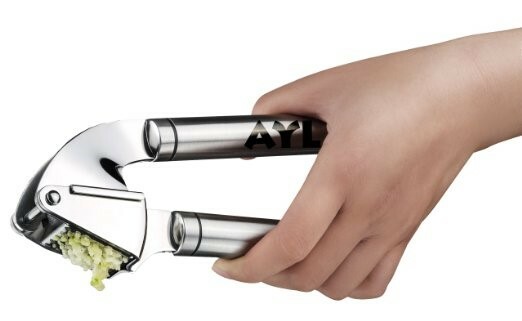 There's even a cool little stainless steel garlic crusher that removes odor from your hands as you wash the tool. Clever, huh? 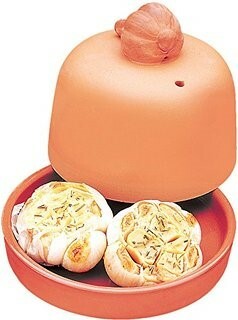 The Garlic Rocker sells online for $14.99, but it does an super job of crushing the garlic and cleaning away odors. 1. Roasting-my favorite approach. It's foolproof at eliminating the powerful and harsh tones of this food. Roasting is how to create rich, sweet, nutty tones. That's because heat destroys that powerful aforementioned enzyme, alliinase. Just roast the heads in a garlic baker with only the tops cut off. You can use roasted garlic in any recipe calling for garlic but since it is milder, you may want to use more. You can roast it in a baker or the oven-either way is good. The one thing I've learned over the years is that if you are serious about garlic, you need to be properly equipped. The above-mentioned garlic baker and a good press are purchases well worth their cost. The press crushes garlic to almost a paste-like consistency and achieves the strongest flavor. A couple other good garlic tools are the grater and the slicer. A grater grates garlic to a very fine consistency for maximum garlic flavor. The slicer allows you to slice garlic paper thin and without getting garlic juices on your hands. You need 1 or more heads of garlic, extra virgin olive oil, a sharp knife, and some aluminum foil. 1. Heat the oven to 400°F: Set a rack in the middle position. 2. Peel (most of) the paper off the garlic: Use your fingers to peel away all the loose, papery, outer layers around the head of garlic. Leave the head itself intact with all the cloves connected. 4. Drizzle with olive oil: Drizzle 1 to 2 teaspoons of olive oil over the exposed surface of the garlic, letting the oil sink down into the cloves. 5. 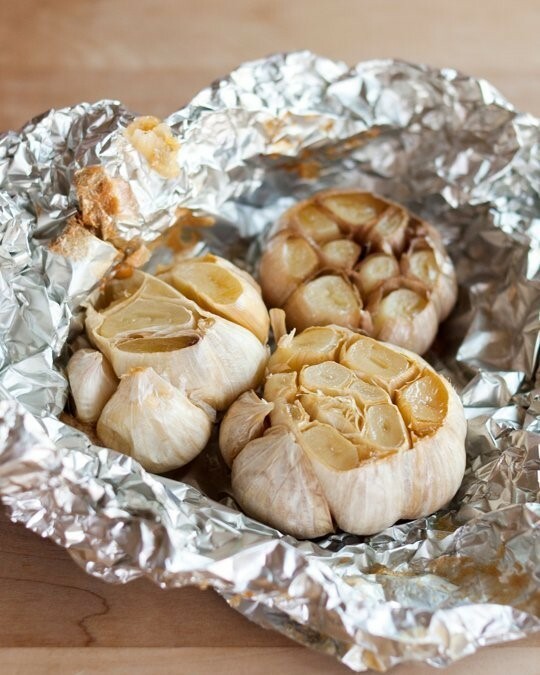 Wrap in foil and bake: Wrap the garlic aluminum foil and roast in the oven for 40 minutes. 6. Begin checking the garlic: After 40 minutes, begin checking the garlic. The garlic is done when a center clove is completely soft when pierced with a paring knife. Even once soft, you can continue roasting until deeply golden for a more caramelized flavor - check the garlic every 10 minutes. Exact roasting time will depend on the size of your garlic, the variety, and its age. 7. Use or store the garlic: Let the garlic cool slightly, and then serve. Press on the bottom of a clove to push it out of its paper. Roasted garlic can also be refrigerated for up to 2 weeks or frozen for up to 3 months.